Rejoignez un équipage expert pour une journée de pêche au large de Santorin. Vous pouvez y participer ou tout simplement regarder à bord d'un bateau de pêche traditionnel muni de filets et de cannes. Nagez et faites de la plongée avec tuba sur l’une des plages colorées de l’île pendant que l’équipage prépare un déjeuner avec la prise du jour, servi à bord avec un assortiment de plats grecs et des boissons à volonté, avec vin et ouzo. Dans un endroit réputé pour ses fruits de mer, il ne fait pas plus frais. I booked this tour on July 10th with a bunch of people who were not terribly keen on going fishing, but wanted to go on a boat for the day. I can tell you that by the time we were done, everyone was ecstatic that they booked. You do not need to fish if you do not want to, rather once the fishing is done, you can lounge around on the boat or hop in the water. Captain Anthi and her crew went out of their way to make sure we were happy. Even if we did not catch as many fish as we did, it still was WELL worth the money. 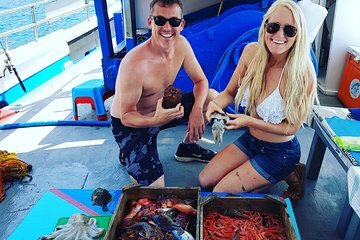 We ended up catching an octopus, squid, barracuda, hermit crab, eel, prawns and about 60 or so additional fish. The crew cooked the food up and we had more than enough to feed us 10x over. Well worth the money! Our family of 5 loved this tour! The kids are 16, 11 and 9, and it was a great experience for each of them. First of all, Captain Anthi is so personable, and she is one of many boat captains in her family! Leaving from Vylchada was a nice change of pace from the busy Oia area that is packed with tourists taking selfies. It felt very authentic in Vylchada. We took off and within 30 minutes the crew was pulling in the traps and nets. Everyone can help bring in the catch and touch almost everything. While the boat is anchored near white beach, the crew is cooking up an amazing lunch and we enjoyed some pole fishing. Once lunch started arriving, there was plate after plate after plate of fresh seafood to enjoy on the deck, along with unlimited local beer, wine and soft drinks. A truly enjoyable day!!! Highly recommended!